Magazine3 premium WordPress themes providers has released their one more Responsive WordPress premium theme Fit&Healthy, for Fitness and Health bloggers. Fit&Healthy Responsive WordPress Theme is not only for Health blogs but it can be also used for Fashion websites and general blogging websites. Fit&Healthy is premium Fitness and Health blogging WordPress theme. Every element of this theme is well crafted and makes your site look professional website and you get maximum exposure to your content. Fit&Healthy premium theme point out with features like Responsive layout fit for smartphones and tablets, Innovative Thumbnail Type, Featured SlideShow, Built-in SEO options, various web elements to look professional site, Easy Drag & Drop Menu, Unlimited Color Schemes, 7 different advertisement placement areas, 5 widgetized areas, jQuery Tabs widget in sidebar, Theme Control Panel and so on. Check out the some great features in details which are included in Fit&Healthy Premium WordPress Theme below. Now don’t worry about device compatibility or browser size. With Fit&Healthy Responsive WordPress Theme, the fluid responsive layout makes it adapt for any situation. Fit&Healthy Responsive Theme with fluid grid system which adapts your website to any mobile devices and the desktop or any other viewing. As always Magazine3 team designed awesome looking header which is perfectly fits for health blogs. They have added main navigation menu below this area. Beside the blog logo they have added a search bar at the right side to search articles from the blog. Like their previous Problog WordPress premium theme, this theme will also feature Innovative Thumbnail Types, and with the help of this. 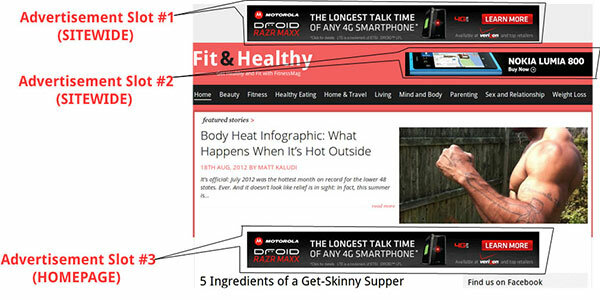 anyone can control the look of blog posts in Homepage. 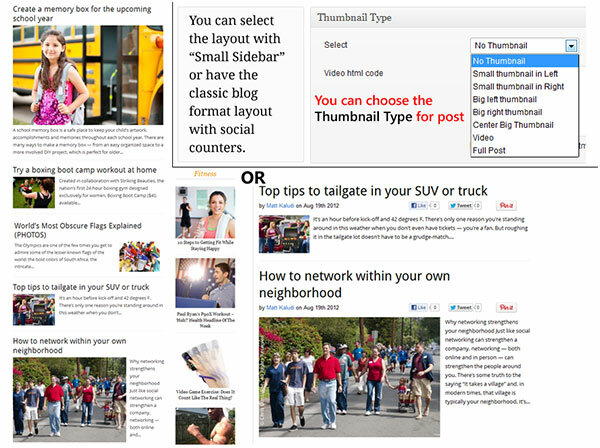 You can have thumbnails in left, right, center, a video or the classic blog post format to show on homepage. As I said earlier, not only health bloggers can use this theme, but it can be used for other niche blogs like Technology, Fashion, Travel and so on. This theme have options to select the proper color scheme which will suit the blog niche. They have provided awesome Global color manager which can change your skin instantly. Fit&Healthy Global color options makes your website even cooler. Fit&Healthy Responsive theme has 7 different advertisement placement areas with on/off option, Plus an ad widget for sidebar to add anywhere in sidebar without adding title. 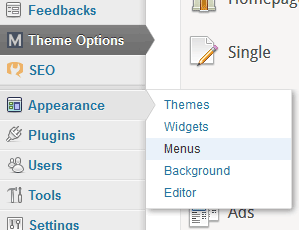 WordPress Widgets are designed to provide a simple way to arrange the various elements of your sidebar content without having to change any code. 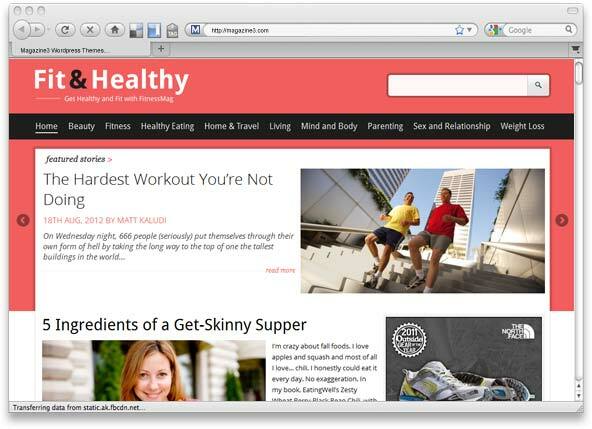 Fit&Healthy WordPress Theme comes with several great widgets. There are 5 Widgetized Areas including Most popular posts widget and Latest Twits and so on. Magazine3 provided Theme Options like they always provides for all of their themes, where you can manage everything like you can add your logo, customize navigations, setup featured categories & ads in just few minutes. You can setup awesome professional Blog in few minutes. All theme licenses have lifetime support, lifetime updates, documentation and tutorials and the Photoshop PSD file of the theme logo. There are three licenses available for people who want to use the theme on one website. The basic license is $49 but makes it necessary that you retain the link back to Magazine3. For $59 you’ll be able to remove the footer link and for $69 you can get the Photoshop PSD file of Layout Elements. For People who want to make use of the design on multiple website have two options. The basic multiple license is $99 however the footer link needs to be kept. For $129 it is possible to remove this credit link to get the Photoshop PSD file of Layout Elements. If you are planning to buy one of the premium theme for your blog, then I will highly recommend Fit&Healthy Responsive theme. As the cost of the theme is not as high and it comes which some extra ordinary features with great options of customizations. 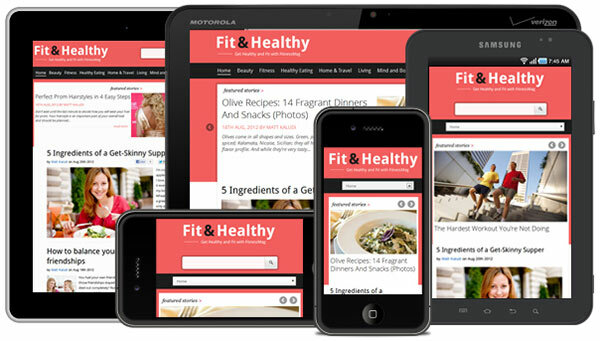 Fit&Healthy Responsive WordPress Theme is unquestionably recommended for bloggers. It can be used in Fitness and Health blogs, technology blogs, business blogs as well as for general blogging and news websites.